Kicking World held their 6th Annual Jersey Shore kicking camp at Toms River HS North this past weekend. Kickers and Punters from all over New Jersey, Pennsylvania, New York, Virginia and New Hampshire were in attendance. The weather was HOT but the kicking was hotter. We held our 6th annual Jersey Shore kicking camp this past weekend at Toms River HS North. Kickers and Punters from all over the East Coast traveled to learn and improve their skills and compete for recognition and to see who the best specialist would be. Campers came from New Jersey, Pennsylvania, New York, Virginia and New Hampshire. Two new camp records were set and one new student made the Kicking World Hot Prospect List. Read on for a detailed kicking competition summary where a few young men set themselves apart to garner attention and show they have what it takes to play at the next level. View camp results from all our camps. In the younger group which was comprised of kickers and punters in grade 8, 9 and 10, we had quite a kicking competition! First time camper Nicholas Galanti, Class of 2016 kicker/punter of Freehold Twp HS won the punting competition. Returning camper and active Kicking World student Pat Davis, Class of 2016 kicker/punter (incoming sophomore) from Lacey Township HS dominated the kickoff competition with a whopping 60 yard kickoff average. Pat’s kickoff competition win made him the first Kicking World camper to win 3 consecutive kickoff competitions at a Kicking World camp (2011 Jersey Shore kicking camp – younger group Kickoff Champion, 2013 North Jersey kicking camp – younger group Kickoff Champion, 2013 Jersey Shore kicking camp – younger group Kickoff Champion). Pat Davis is on the Kicking World Hot Prospect List and one of our top kickers in the Class of 2014. In the younger group field goal competition we had a real battle. Pat Davis and Nicholas Galanti had identical stats through the first 9 kicks and it took a 10th kick from 53 yards to seal the victory. The pair made kicks back to 53 yards and on the 3rd attempt from 53 yards Pat sailed his just wide left while Nicholas hit his through for the win. Nicholas Galanti from Freehold Twp. HS is the 2013 Jersey Shore field goal competition winner. Congratulations Nicholas. Nicholas and Pat were the top performers in the younger group. Pat Davis shows a college ready leg on field goals and kickoffs with spurts of punting ability as well. Nicholas has a ton of power on field goals but needs refinement in his mechanics to ensure consistency over the long haul. In our older division, returning camper and active Kicking World student John Coleman, Class of 2014 kicker/punter from Sparta HS stole the show. 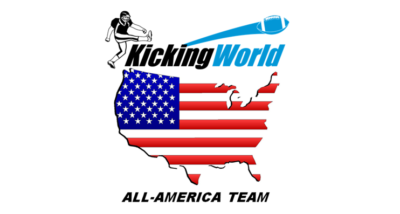 John is on the Kicking World Hot Prospect List and has attended our camps consistently over the last 3 years and continues to improve each time we see him. At the Jersey Shore kicking camp this weekend, he won the punting competition with a 42 yard net punt average with punts in the 4.0+ hang-time range consistently throughout camp. John has drastically improved his punting ability over the last 2 years and is now not only a Division 1 ready field goal and kickoff specialist, but shows promise as a punter as well. John has already received offers from a couple Division 1 FCS football schools and he is currently weighing his options. He will be playing in college next season. John Coleman is a must watch kicker/punter combo in the Class of 2014. In our older division kickoff competition, returning camper Elia Palmese, Class of 2015 kicker out of Rancocas Valley HS stole the show on kickoffs. Elia had an excellent showing at our 2013 North Jersey kicking camp at Montclair State University where he earned co Golden Boot honors for winning the younger group field goal competition. In this weekend’s camp, Elia was in the older division and won the kickoff competition with a 65 yard average kickoff and 3.81 hang-time average. Those kickoff numbers make Elia Palmese a college-ready kickoff specialist. Elia has a very nice field goal leg and should continue to improve as he fine-tunes a few small fundamental points in his field goal process. Elia has the potential to be an excellent college kicker. Because of Elia’s impressive consecutive Kicking World camp performances this year, he has been added to the Kicking World Hot Prospect List. In our older group field goal competition, we had a close race where Erik Anderson (Pinkerton Academy, NH) and John Coleman (Sparta HS, NJ) had nearly identical field goal stats back to 53 yards. On the 3rd attempt from 53 yards, John Coleman was able to seal the deal for his 3rd field goal competition win. John’s field goal competition win this weekend set a new Kicking World camp record where he became the first student to win 3 Golden Boot Champion awards (2011 Jersey Shore kicking camp – younger group, 2013 North Jersey kicking camp – older group, 2013 Jersey Shore kicking camp – older group). Congratulations John on one heck of an accomplishment! View all the kicking camp statistics from this weekend. Even with the hot temperatures, our 6th Annual Jersey Shore kicking camp was a major success and many students dramatically improved their skills. Our last New Jersey kicking camp will be on October 13th in Toms River, NJ. We hope to see you there. Are you a coach or recruiting coordinator? Feel free to contact Coach Brent Grablachoff directly to find out more about students mentioned in this article or about any of our specialists seen on the Hot Prospect List or All-America Team or on any of our YouTube videos or blog write-ups.